Rolex SA and its subsidiary Montres Tudor SA design, manufacture, distribute and service high-quality wristwatches sold under the Rolex and Tudor brands. Founded by Hans Wildorf and Alfred Davis in London, England in 1905 as Wilsdorf and Davis, Rolex moved its base of operations to Geneva, Switzerland in 1919. Bloomberg Businessweek magazine ranked Rolex No.71 on its 2007 list of the 100 most valuable global brands. Rolex is the largest single luxury watch brand, producing about 2,000 watches per day. 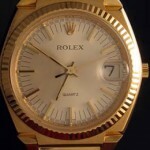 Vintage Rolex 18k Yellow Gold Lady-Datejust Ref. 6517 Head out of Estate! NICE! Rolex Oyster Perpetual 39 Blue 114300 Like New! Warranty, Original Box/Papers! !